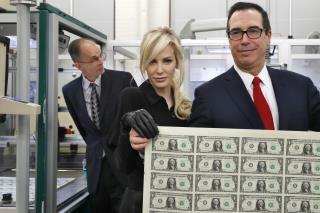 (Newser) – It wasn't exactly a flaming bag of dog poop, but Steve Mnuchin lives in a nicer than average neighborhood: Authorities say a gift-wrapped box of horse manure addressed to the US Treasury secretary was found near his home in Los Angeles, reports the AP. The package was found Saturday night in the tony Bel Air neighborhood after it was dropped off at a neighbor's house. The Los Angeles Police Department's bomb squad was called to the home and officers opened the box, finding a pile of horse manure inside. TMZ chortles that "Mnuchin and wife Louise must have been naughty this year," noting that the couple have attracted their share of controversy in 2017. LMAO! He should re-gift it for that thing he’s married to. LOL, yeah OK, like he hasn't had another guy's fudge on his nose and tongue before! How is this even news? remember when the DEM base claimed to be the moral and tolerant base. the intelligent folks. but below our local DEM tools are loving the idea of sending feces to a politician. That dumb, ignorant, childish and hypocritical same folks would be saying its a lethal threat if done to a DEM.